The Chair of Heritage for Peace, Isber Sabrine, attended the workshop Heritage in Conflict: A Review of the Situation in Syria and Iraq at 63rd Rencontre Assyriologique Internationale, and presented “Protecting Heritage: The Work of Heritage for Peace and Others in Syria”. Abstracts for the session are available here. Aleppo’s Great Mosque. Photo shared on Leen Yasmin Rashied’s Facebook page. 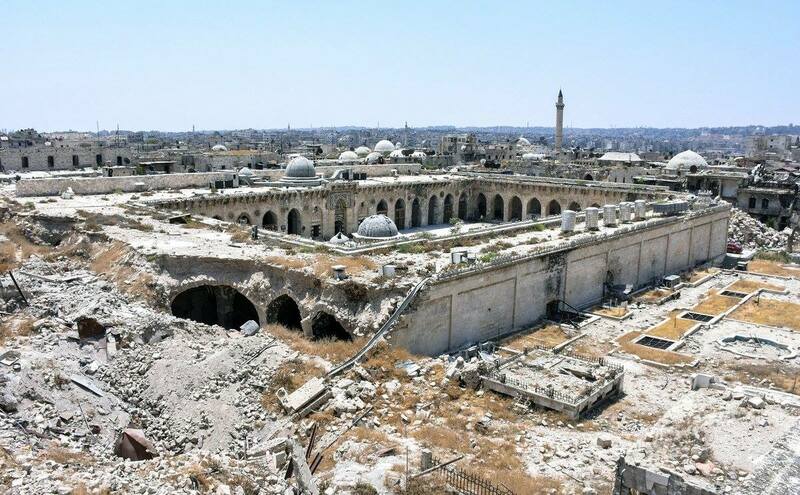 Damage to Aleppo’s Great Mosque from a rarely covered angle – photo shared on Leen Yasmin Rashied’s Facebook page here. The Idlib Antiquities Center has shared photographs of the extensive damage the Al-Farmiya Castle, in the village of Al-Mawzira, Idlib. According to the center, the site has gone through random excavations (i.e. looting), and damage from bombing and missiles throughout the conflict. The castle lies on a small hill in the middle of the village, with only four arches and a watchtower left. No dates nor specific reasons for the particular damage has been stated, though the photographs, released on 12/07/2017, can be seen here. The DGAM has shared additional photos of the state of the site recently recovered site of Resafa, available here. “Syrians aren’t just rebuilding an ancient mosque in Aleppo – they are rebuilding their community”. This article looking at the rebuilding work, particularly the Umayyad Mosque, in the Independent. On July 30th, 2017, the National Higher Steering Committee for the Restoration of the Old City of Aleppo met for the first time. They discussed the possible restoration works involving Souq Al-Suqatiyeh and the Citadel of Aleppo at the Ministry of Culture. More on the meeting can be read here. “Our vision is to rebuild the Old City exactly as it was before the war, with the same stones where we can,” said Mazen Samman, UNESCO’s associate program coordinator in Aleppo, in an interview in Reuters. On July 30th, 2017, the Authority of Tourism and Protection of Antiquities stated that they were carrying out an awareness campaign aimed at educating the public on Syria’s history. They have held several lectures in July in various locations. Photographs of the lectures and the institutes involved can be seen here and here. On August 1st, 2017, they released a statement on their visit to the Sukera Citadel to prepare for a restoration project. The citadel is located in southwest Al Hasakah, and according to the ATPA was previously used by “extremist groups.” Photographs of their initial documentation can be seen here. ATPA have documented two Roman Byzantine graves in preparation for conservation and maintenance project, one of which had been vandalised, and one converted to an Islamic shrine. See pictures here. On August 1st, 2017, ATPA posted documentation of various archaeological sites in the Al Hol area and the Middle Euphrates valley (Tell Bazi – Tell Mnbaqa – Tell Sweyhat – Jabel Khaled – Tell Al Abed – Jerf Al Ahmer). They were originally published in May 2017, and some photographs can be seen here. As reported in our last two newsletters, as part of the workshop organised by the Idlib Antiquities Center, more can be seen on their recent work. On July 20th, 2017, the Al-Jisir TV channel reported on the signing of a law that makes it illegal to excavate and loot in Idlib, which can be seen here, and the Deraya Network which published a video on July 27th, 2017 on the workshop’s latest efforts to coordinate on increasing the protection of archaeological sites here. The death of Syrian activist Bassel Khartabil has been confirmed. Khartabil founded #NewPalmyra, an open-source project which created 3D models of Syrian heritage sites, some of which – like the Tetrapylon – were printed in major locations. He was an open-source software developer and a Creative Commons supporter. He ran a hackerspace in Damascus, and in 2005, began creating 3D models of Palmyra’s structures to show others around the world the history and culture of his country. Palmyra Coordination Facebook page released a statement [in Arabic] on their Facebook page here. Destruction of sacred items is profoundly destabilizing. The theft, trafficking, and destruction of sacred art is a special subset of the larger study of the movement of illicit art and antiquities. It has its own unique causes and, perhaps, its own unique solutions. The purpose of this site is to try to understand this phenomenon better by collecting information. Hanson writes for the Navy Times about how US forces are protecting sites in Syria whilst fighting ISIS, with a focus on Raqqa. The article provides an interesting context to the difficulties of protecting heritage in conflict. On July 13th, 2017, the closing message of an international conference in Nara, Japan, was released, reaffirming their commitment to the Syrian people and their heritage. Their statement can be read here. The conference has been a hot topic of discussion, and a recent article in the pan-Arab Asharq Al-Awsat newspaper elaborates how the conference sought to separate the historic city’s reconstruction from the conflict’s politics. The article, published on July 21st, 2017, can be read here. A reconstruction of the historic gate of the city of Palmyra, launched by Dubai Foundation for the Future in collaboration with the Institute for Digital Archaeology has received more than two million visitors during its stay in Italy. The reconstructed model has been on an international tour to promote the role of technology in preserving the world’s cultural heritage. The article [Arabic] stated the figures on the Government of Dubai’s website here, while more can be read [English] about the arch in Italy here. Sisters Nour and Bayan grew up in the heart of Syria’s capital Damascus, surrounded by the history and beauty of the city. Now it is dangerous to return to their home country for the foreseeable future; they reflect and share their personal stories of culture and heritage. BWMUN discusses the attack on World Heritage sites and the actions of states to protect sites, here. National Geographic looks beyond ISIS’s headline destruction to the Muslims affected, here. The Wall Street Journal looks at ISIS and antiquities looting here. John Gendall looks at the complexities of reconstruction of destroyed historic sites for Architectural Digest here. Al Watan Voice cover the damage to the wall of Resafa here. A paper on academia by C. Doppelhofer also addresses this question: “Will Palmyra rise again? – War Crimes against Cultural Heritage and Post-war Reconstruction” (available here, log on required, but it’s free). Interview with Neil Brodie about looting and his new policy paper for the Antiquities Coalition, here.